We’ve done this show before and it was so much fun that we’ve done it again and again. This Sunday at the Cottage Bistro (4468 Main Street) Mike Mackenzie and I will be doing the fourth edition of this Say Wha?! spinoff. Mike shares his passion about the musicals with us and talented musical theatre actors will perform HORRIBLE songs from the Broadway cannon. Sound good? We think so! 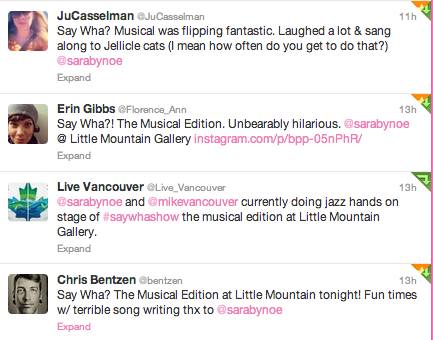 But don’t take our word for it, here’s what audiences have said (ok, tweeted).